Today, we continue our examination of Newark restaurants, starting with the 20th century when hundreds of restaurants opened. We will concentrate on a baker’s dozen, which opened in the first half of the century and closed in the century’s latter years. Each was different, important and fondly remembered by a host of patrons. In 1912, the South Park Restaurant opened as a modest and unassuming place of business on Lincoln Park, specializing in homemade soups and salads. It was founded by a Greek immigrant family determined to survive the Depression. It was remodeled for the last time in 1946 and survived the 1967 riots before changing hands. In 1912, Biase’s, along Bloomfield Avenue, opened. 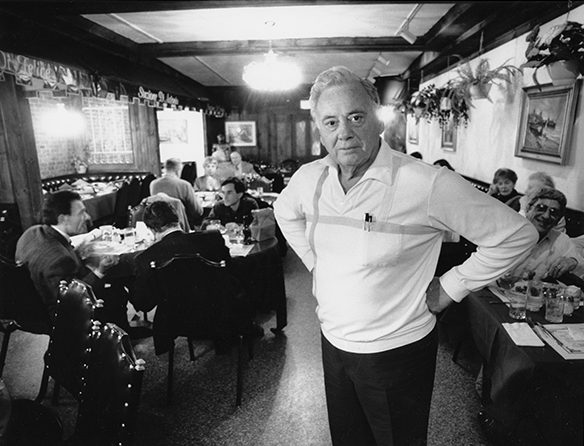 The Italian restaurant, described by one North Ward resident as 'a symbol of immigrant heritage and pride, remained a cultural institution until the 1990s. Founded by Philip and Nellie Biase, the business grew to include several lounges, a large dance floor and banquet halls. Its two-story Columbus Room featured ornate candelabras. During its more than 65 years, Biase’s was headquarters for Newark’s Carnevale, an Italian Mardi Gras. Visitors included George Bush, Vic Damone, Bob Hope, Joe DiMaggio, Dom Deluise, Frankie Avalon, Debbie Reynolds and Tommy Lasorda. The place closed following a fire next door. The Downtown Club, opened in 1913, had three homes before going out of business in 1983. It was originally located in the old Kinney Building at Broad and Market streets. In 1940, it moved to 744 Broad, where it remained until 1955, when it moved to the 10th floor of Bamberger’s. There it remained until 1983, when it closed, ending the oldest private dining club in the city. Said one diner at the time, 'I think Newark lost a valuable place where people could meet, socialize and do business.' The Saxony Cafe at 796 Broad St. was established in 1914. The unique feature of this institution was an 11-foot-long by six-foot-wide Adolph Blick sculpture above the front door depicting Gen. George Washington in Newark in 1775. Inside the 6,000 square-foot dining area, 460 meals were served daily. The Colonnade Cafeteria opened in 1915 and closed in 1969. It was known to thousands as a Newark luncheon institution and was a branch of a chain that had other restaurants in the Midwest. Its superb baked goods drew diners from all over the downtown at lunchtime. Fucci’s Italian Restaurant, originally located at 83 Warren St., merged with 13 Central Avenue in 1953. It was operated by James Fucci and was considered Newark’s oldest Italian restaurant. Its small dining room, the Hartley Room, was named for former Rep. Fred A. Hartley, co-author of the Taft-Hartley labor act. Childs was another local chain restaurant. At one time it had four downtown sites. My favorite was the one at Broad and Park streets, which had a second-floor business club made to look like a London gentleman’s club, complete with leather wingback chairs, fine china and cutlery, and charming waitresses in black uniforms with white aprons. The Vesuvius Restaurant opened in 1923 and was destroyed by fire in 1996. Another of the important old-time first-class eating houses, it made everything Italian and made it very well. Architecturally, the facility featured a large verandah supported by Doric columns that looked out over a Neapolitan mural. The walls were red. Tables were covered with white cloths and decorated with red napkins. Like the other large Italian restaurants in the city, Vesuvius hosted many celebrities, including Al Pacino, Bon Jovi and the biggest name of all—Pope John Paul II, who supposedly was 'sneaked over for dinner when he was in town in 1996.' In 1950, William E. Naue merged his two restaurants, Leon’s at 47 Fulton St., and the Roost at 43 Rector St., into a single operation. The new place opened in October 1950. For more than a quarter-century, it was the leading business restaurant and meeting place. The Roost could accommodate 120 people in its banquet hall. Naue also owned the Chanticler in Millburn. Bodholts Diner in Roseville was at 511 Orange St., where it replaced an earlier structure built by the Manno Dining Car Co. of Belleville. Neighborhood concern that a dining operation would attract rough characters resulted in a decor that was designed to appeal to women. The 1930s also saw the startup of several Chinese restaurants in the old Mulberry Arcade, an area in the vicinity of Mulberry and Lafayette streets. The Sunday Call described the small eateries as drab, but with good food. A sample menu was similar to what you would get in a good Chinese establishment today, but was quite different for a community heretofore not familiar with Eastern cuisine. Clinton Manor, later Ebony Manor, was a large food establishment at 100 Clinton St., designed to serve 1,200 patrons in three big rooms. It was best-known for excellent service as well as interior elegance. Its Gold Room seated 600 and the Rose Room could accommodate 300. The place was recently renovated and reopened by the Provision of Promise Ministries as The Talk of the Town. Just a few doors away comedian Jackie Gleason launched his show business career in 1937 at the Club Miami. A jovial host Newark’s third hotshot restaurant was Eddie Dwyer, a kindly Irishman whose reputation extended beyond the city borders, attracting steak lovers from around the metropolitan area. Born in New Hampshire, Dwyer came to Newark in 1923 at age 22 and worked in a variety of speakeasies before opening Eddie Dwyer’s Elbow Room following the end of the Great Depression. For almost a half-century he was Broad Street’s most congenial tap room owner, operating a first-class steak house. An all-around bon vivant, he welcomed the whole world to 'my house,' which translated to all of Newark. Dwyer’s work was shared by his colleagues, Rudy Jackson, Otto Hammer and Mary Hunter. Hunter was the bartender. Dwyer’s theory was that 'the clientele should be satisfied and comfortable. In my house, I’d like to know that my friends can relax, unwind and maybe forget their problems while in an atmosphere of good cheer.' Dwyer also was famous for his 'quotable quotes,' puns and sayings about the world, sports and local news, often painted in the restaurant’s windows. One day, when a sewer line collapsed, he quipped, 'Just how low can Newark and Broad Street sink?' On St. Patrick’s Day he had fresh sod spread along the sidewalk and at least one Irish piper serenading the passersby. Throughout his life Dwyer worked hard to keep up the tradition of being the Best Saloon Keeper in America. The old Irishman with a New England accent adored Newark and that admiration was returned by his customers and friends.